The artist decorated wares produced by Rookwood can range in value from hundreds to thousands of dollars. These hand-decorated pieces are usually more valuable than the company's mass-produced one-color production lines. Artist decorated pieces often have the initials or name, known as an artist's cipher, incised or printed on the bottom of the piece below or near the reverse RP mark. Pieces made by the most skilled of Rookwood artists are very desirable to collectors, so being able to identify them correctly is an advantage to both sellers and buyers. The incised L.A. mark used by Louise Abel is shown here to the right of the reverse RP logo used by Rookwood. It can also be printed under the glaze in ink and looks more like an L imposed over an A within a circle in that form. See below for more on Baker's work with this pottery company. Louise Abel appears to have decorated pottery for Rookwood from the mid-1920s through the 1940s based on the dates found on pieces with her signature. CollectorsWeekly.com reprinted an article from the July 1943 issue of American Collector magazine noting the animal sculptures she was doing for Rookwood at that time. Her work has an average following with collectors, according to artpotteryblog.com. The incised C.A.B. mark used by Constance Baker is shown here to the right of the reverse RP logo used by Rookwood. See below for more on Baker's work with this pottery company. Constance Ann Baker decorated pottery for Rookwood from 1892 through 1904. She imaged many of the Indians from the Cincinnati ​Zoo in the late 1890s, according to Rookwood and the American Indian: Materpieces of American Art Pottery by Anita J. Ellis and Susan Labry Meyn. Her work is rated above average in terms of interest with collectors today. The incised I.B. mark of Irene Bishop is shown here below the reverse RP logo used by Rookwood. See below for more on Bishop and her work with this pottery company. Bishop decorated Rookwood Pottery in the early 1900s using "IB" as her artist's cipher. Her pieces generally well-regarded and tend to hold average interest with collectors in comparison to other Rookwood decorators. She married fellow Rookwood artist Edward Hurley, who is also well known as an artist in other genres including etchings and paintings, in 1907. The incised mark of Arthur Conant is shown here below the reverse RP logo used by Rookwood. See below for more on Conant's work with this potter. Arthur Conant decorated pottery for Rookwood from 1915 to 1939. His incised mark (also known as an artist's cipher), as shown here, is a C within a square. He is best known for scenic vases depicting plants, flowers, and animals including birds. The decor of this artist, in terms of color and composition, often contrasts with the work of other Rookwood artists and can be highly valued at auction. The incised mark of Ed Diers, simply "ED", is shown here along with the reverse RP logo used by Rookwood. Dates to 1915 as indicated by the Roman numeral. Ed Diers was an artist at Rookwood from 1896 to 1931. He was educated at the Ohio Mechanics Institute, Industrial Art School and the Cincinnati Art Academy, according to notes posted on AskArt.com. He is well known for his particular skill in executing landscapes on the Rookwood pieces he decorated. The incised E.T.H. mark used by Edward Hurley is shown here to below the reverse RP logo used by Rookwood. See below for more on Hurley's affiliation with this pottery company and his other work. Edward Timothy Hurley decorated pottery for Rookwood from 1896 through 1948. He married fellow Rookwood artist Irene Bishop in 1907. His work is regarded as above average by pottery enthusiasts when compared to other Rookwood decorators. His etchings, paintings, and illustrations made him a major architectural and landscape artist, especially in the Cincinnati, Ohio area, according to annexgalleries.com. The L.N.L. mark used by Elizabeth Lincoln is shown here above the reverse RP logo used by Rookwood. See below for more information on the work of Lincoln. Elizabeth (Lizzie) N. Lincoln (Lingenfelter) decorated pottery for Rookwood from 1882 through 1931, according to InternetAntiqueGazette.com. Her work is rated high in terms of interest with collectors today. The incised circular MHM mark used by Margaret Helen McDonald is shown here to the left of the reverse RP logo used by Rookwood. See below for more on McDonald's affiliation with this pottery company. Margaret Helen McDonald joined Rookwood as a pottery decorator in 1913. Rookwood and the American Indian: Materpieces of American Art Pottery by Anita J. Ellis and Susan Labry Meyn notes that she was the daughter of William McDonald who was in charge of the architectural faience department at Rookwood. She continued to work for the company through 1948, according to artpotteryblog.com. This pottery decorator should not be confused with artist Margaret McDonald Pullman of Chicago who died in 1892. She was married to George M. Pullman, nephew of the Pullman Railroad Car founder. The incised mark of master potter Rueben Earl Menzel, who went by Earl, is shown here below the reverse RP logo used by Rookwood. See below for more on Menzel and his work with this potter. The Rookwood mark shown indicates this piece was decorated by Earl Menzel in 1951. Menzel decorated Rookwood Pottery from 1896 through the early 1950s using “REM” (backward R joined with E and M) as his artist's cipher. His pieces generally well-regarded and tend to hold average interest with collectors in comparison to other Rookwood artists. He had the longest tenure of any employee in the company’s history spending 63 years with the firm. The incised of mark Albert Pons (also referenced as Ponds in some resources) is shown here above the reverse RP logo used by Rookwood. See below for more on Pons. and his work with this potter. The Rookwood mark shown indicates this piece was decorated by Albert Pons in 1907. Pons decorated Rookwood Pottery from 1904 through 1911 using “AP” (A and P linked together) as his artist's cipher. His pieces generally well-regarded and tend to hold average interest with collectors in comparison to other Rookwood artists. The incised O. G. R. mark used by Olga Geneva Reed (Pinney) is shown here below the reverse RP logo used by Rookwood. See below for more on Reed's background. Olga Geneva Reed (Pinney) decorated pottery for Rookwood from 1890 through 1909, according to Rookwood and the American Indian: Materpieces of American Art Pottery by Anita J. Ellis and Susan Labry Meyn. Other sources cite 1903 as her Rookwood departure date, but many pieces with Rookwood RP stamps dating after 1903, and even 1909, have been marketed so there is some discrepancy on how long Reed worked with the company. In 1928 she married a former Rookwood decorator, Matt Daly, who was not only highly regarded by the company but also known to be a skilled portrait artist. The "S X" mark shown here in black is that of Sara Sax, a respected Rookwood artist who worked for the potter for many years. According to Rookwood expert Riley Humler in a CollectorsWeekly.com feature, Sara Sax did not "come into her own" to produce her best work until after World War I. The mark shown here dates to 1931 as indicated by the Roman numerals below the reverse RP logo. The reverse RP mark depicted here was used by Rookwood after 1901. In 1886, the company began using this the reverse RP and added a flame each year to indicate the date their pieces were produced. The incised mark of Carl Schmidt is shown here to the right of the reverse RP logo used by Rookwood. See below for more on Schmidt's work with this potter. Carl Schmidt was employed as a pottery artist with Rookwook for many years. 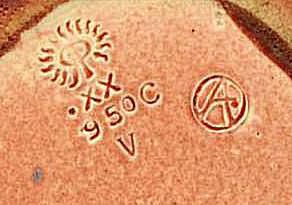 The mark (also known as a cipher) shown here dates to 1904, according to MorphyAuctions.com, and is a more professional stamping of his SC within a circle mark compared to some of the hand incised signatures associated with this artist. He is well known for his landscape scenes ​but did other decorative motifs as well. Rookwood works by Schmidt are very desirable to collectors and have sold for tidy sums at auction. The incised C.S. mark used by Carrie Steinle is shown here to the left below the reverse RP logo used by Rookwood. A number of different variations of this mark were used by this artist, including versions written in ink under the glaze rather than incised into the piece. See below for more on McDonald's affiliation with this pottery company. Caroline Frances Steinle, known as Carrie by her employer, worked as a pottery decorator for Rookwood from 1892 through 1925, according to ArtFact.com. She was attributed as one of the women who helped make Rookwood Pottery a success in the December 13, 1917 edition of The Pottery, Glass and Brass Salesman. In comparison to other Rookwood decorators, her work holds average interest from collectors. The incised mark of Charles Stanley todd is shown here below the reverse RP logo used by Rookwood. See below for more on Todd's work as an artist. The Charles Stanley Todd incised C.S.T. mark (also known as an artist's cipher) shown here dates to 1918. He is well known for his ceramic arts with Rookwood early in his career as an artist, but also for his later watercolors featuring wildlife and landscapes. The intertwined S.T. mark (which looks more like S.J.) of Sallie Toohey is shown here beneath the reverse RP logo used by Rookwood. See below for more information on the work of Toohey. Sara "Sallie" Alice Toohey decorated pottery for Rookwood from 1887 through 1931, according to InternetAntiqueGazette.com. Her work is rated above average in terms of interest with collectors today. Albert Robert Valentien went to work for Rookwood at the age of 19 and worked there for 24 years, eventually becoming the company's head decorator. Valentien is well known for his contribution to ceramic arts and especially noted for the floral decor he imparted on Rookwood pieces. In fact, he received a gold medal at the Paris Exposition of 1900 in recognition of his skill as an artist while working for Rookwood. Many prominent decorative arts museums hold his work, and he is also known for his paintings which can also be quite valuable to collectors. Ellen Browning Scripps commissioned Valentien to paint 1,000 native wildflower paintings for her private library in La Jolla shortly after he moved to the San Diego area. This was a project he completed over 10 years. "Following his wildflower studies, Valentien began painting landscapes in the California Impressionist style. His botanical watercolors, renowned for their realism, are perhaps the finest representations of California flora," according to the A.R. Valentien restaurant Web site. The restaurant, a fine dining establishment in San Diego, features Arts & Crafts decor in addition to memorabilia from the Valentien estate and significant works painted by the artist. The D.W. mark used by Delia Workum is shown here to the left of the reverse RP logo used by Rookwood. This mark is found on many pieces of pottery decorated by this artist during the mid-1920s. The incised of mark Josephine Ella Zettel is shown here to the bottom left of the reverse RP logo used by Rookwood. See below for more on Zettel's work with this pottery company. Josephine Ella Zettel was born in Ohio in 1874, according to AskArt.com. She designed and decorated pottery for Rookwood from 1892 to 1904. John Zettel, who was also an artist and an architect, was her brother. Her work is held in the Victoria and Albert Museum in London as well as in many collections of Rookwood pottery.